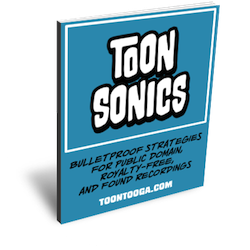 Grab my FREE Cartoon Sound Guide! Ideas are cheap and abundant. What are you doing with yours? Although, this is not a post about books, I would like to use them as an example: the nature of a book is that it is read. It’s purpose is to be read. The original books were hand copied by monks whose lives were devoted to writing these books which would last for years and be read over again and again. Even after the printing press and movable type had been established, when monks were no longer the main source of written content, books were kept and read. The idea of destroying a book was preposterous. You wouldn’t destroy it, or even throw it away, but you kept it. Yes, there were book burnings, but that was not a hugely positive event – lot’s of anger, and yelling – not pretty. But now, once content is consumed, and possibly ’shared’, it is then left behind. It just seems more severely forgotten as we tend to continually move forward to fresh content. I’m not saying that it is necessarily bad, or that this effect happens to every bit of created content. I am just saying that it IS a real and prevalent behavior. The first time that I ever noticed this was about five years ago, when I was talking to someone about managing their iTunes TV shows. She said, “I just delete it after I watch it.” I was aghast. I still pause in disbelief when I think of it. I curate video, and music, and documents – I don’t throw them away after I’ve enjoyed them. I know that I can enjoy them again, so I find a way to preserve the files. Most do not share my enthusiasm. The perfect historical example has to do with re-runs. A re-run is a second, or subsequent, broadcast of a regularly scheduled television show. A production company may plan to shoot 13 episodes for a season, or 26, and in some cases more. The new season would begin around September, and run through the planned episodes. The time in between the last new episode and the next season is filled with repeat showings of that seasons episodes – RE-RUNS. The reality is that almost everyone hated re-runs, and they wouldn’t watch them. “Oh, I’ve seen that one,” they would say, and change the channel, or turn the thing off completely. So, this has been a real behavior for at least a couple of generations. People, for the most part, don’t cherish content, they consume it. And, now there is more content than ever. It is being consumed and left behind for the next, and with binge watching, it is being mass-consumed. As creators, the idea of someone consuming our art then deleting it, is horrible. But, in most cases, that is what happens. Here is the good part of all this – There are content-hungry people out there, and you are a content creator. Ideas are cheap. They cost nothing, and they are so abundant, it’s almost infinite. Ideas can also be stored indefinitely, they hardly ever spoil. You have ideas – good ones. You also have time. Time is NOT cheap. And it’s limited. You can’t actually store time, even though people talk about saving time – you can’t keep any extra for tomorrow, it just ticks away whether you use it or not. Since it takes effort and time to transform any of your ideas into content (article, cartoon, painting, poem, film, etc), grab an idea, any idea, and schedule the time you have to develop the idea into a finished piece of content. Once you have done this, start asking people to consume it. Some will, some won’t. Now, make some more, come back to the people who consumed your previous content, and ask if anyone wants seconds. Some will, some won’t. Keep feeding the content-hungry, and before you know it, they’ll be asking you when the next creation will be ready. Don’t be so concerned about the ideas, think more about managing your time. You’ll become more accomplished with every piece of content you finish. Finding your audience begins with knowing yourself. The longer journey, though, is hearing the genuine voices of those that are finding you and finding your work. Perfect. So, after you have pushed through the work, solved the problems, and finalized all the steps – your creation is complete! Open the gates, so the masses can be enriched and enlightened. Um . . . where are the masses? Where is that well-beaten path? That old saying left out some important info, like, how did all those path beaters find out about the better mousetrap? And, how much feedback did the inventor need to finally land on the ‘better’ idea? Old sayings aside, there are currently an abundance of opportunities to not only get your work in front of people, but also to have direct access to that audience. And, a potential key feedback point in your work is the direct response from the people consuming it. So, who is responding to your content? And, what is their response? What usually happens in the beginning, as we are first putting our content out in an accessible place, is that we don’t get any response. Basically, no one is consuming the content. Who is my art speaking to? Find out how old they are. What do they do? What shows do they watch, or what do they like to read? Are they active? Where do they live? What do I hear them saying about my art? Listen to the specific words they use to describe it. Do they think something is missing, or something is too much? Do they look up to your work, or admire it as the thoughts of a peer? How do I feel about their response? Does the feedback make you happy? Sad? Angry? Are they telling you something that you already thought of, or is it a new revelation of your work? Am I able to see a way that their feedback can help me make better art? I am not talking about re-doing the work you have already created, but listening to the input and testing it as part of your process the next time around. • Does copyright even matter anymore? It's all in this guide! It's a free download for Toontooga subscribers. 27 minutes of video and 6 info-packed sections cover protecting your original work while freely distributing it, finding the best cartoon sound options, licensing, and more.